Back in April I posted about a report by the Guardian’s Conal Urquhart (who was briefly filling in for the paper’s Jerusalem correspondent Harriet Sherwood) titled “Israeli authors join campaign to keep Arab bookseller in the country, April 3, which warned that a bookshop at the American Colony Hotel in Jerusalem was in danger of closing. The story focused on the shop’s owner, Munther Fahmi, who was in danger of losing his Israeli residency. Urquhart characterized the dispute, in his April report, over Fahmi’s residency status as politically motivated, and quoted an Israeli journalist claiming that the dispute was “symptomatic of the chauvinistic and intolerant behaviour” (towards Palestinians) displayed by Israel’s current government. Well, evidently Israel’s chauvinism and intolerance was short-lived, as yesterday, Jan. 27, Harriet Sherwood reported, in “Palestinian bookshop owner celebrates Jerusalem residency ruling“, that Fahmi had been granted a two-year residency extension which his lawyers were confident would likely lead to permanent residency status. Of course, the broader political narrative advanced by Urquhart and Sherwood is itself highly misleading, suggesting that Palestinians (non-citizens) who have residency status are exceptional in the threat they face in losing their status if out of the country for an extended time. In the U.S., for instance, absences of one year or more can result in the loss of permanent resident status. But, such immigration and residency issues aside, the significance imputed to Fahmi’s bookshop – which Sherwood described as a “celebrated Jerusalem bookshop patronised by politicians, diplomats, authors and activists” – is difficult to comprehend. However, the suggestion that there is a paucity of English books in Israel (or that Israeli authors writing in English can’t sell their books here) should strike anyone who lives, or has spent any time, in the nation – where shops offering new and used English books are abundant – as especially peculiar. I came to this determination about the grossly inflated significance of Fahmi’s shop while visiting the store in April, but I decided to return (cell phone camera in hand) to demonstrate to those who haven’t been to the shop why I remain curious about all the press the story is receiving. Here’s a photo I took yesterday of the bookshop, which is roughly the size of the bedroom in my Jerusalem apartment. Further, I observed in my original post that Urquhart’s characterization of the shop as “a haven of tolerance for scholars in a bitterly divided city” seemed at odds with the works they carried, which, for instance, included, as their sole book about the Holocaust, Norman Finkelstein’s notorious “The Holocaust Industry”. But, I decided before leaving this time to pay closer attention to the fifteen or so books in the shop’s display window, to see what Fahmi was promoting to facilitate tolerance and harmony in this “bitterly divided city”, as bookshops typically use such retail window space to promote books which sell briskly, or possess a unique, or important, literary quality. As an Israeli, I’m certainly relieved at the reprieve for this literary oasis in the otherwise barren Israeli intellectual landscape – a mecca of ‘peace and co-existence’ which will also certainly never be accused of surrendering to Jewish supremacism. I just don’t get it. These journalists appear to inhabit an alternative universe where black=white and down=up. It’s almost as if they believe that such nonsense is permissible because the end justifies the means. At least CIF Watch does not let it pass without comment. CIF Watch’s attacks on a bookshop known for its rich array of English books and English translations of Israeli and Palestinian writers shows indeed that some of the CIF team may live in an alternative universe where books and culture are not respected. I saw the Sherwood article earlier, and from her description – and the photo! – imagined the bookshop to be a marble-walled labyrinthine affair, a veritable cathedral of literature etc..
And oh dear, what a sorry selection of books it stocks. Do you think Sherwood actually bothered to have a browse there before posting her report? The American Colony bookshop is the haunt of diplomats, foreign and Israeli journalists, Israeli and Palestinian artists, and even some Israeli politicians. It’s one of the most prestigious venues in town, to the point that finding a chair during their summer reading nights is close to impossible; some diplomats send their assistants to keep seats two hours in advance. But I assume you’re not on their mailing list? I’m sure the managements of Steimatsky’s and Tsomet HaSfarim are quaking in their shoes. Most definitely not! Couldn’t have anything to do with most Israelis reading Israeli literature in Hebrew, could it? Abtyalon, the American Colony bookshop has 50 times more English books than the biggest Steimasky branch in Israel. The public library in Mitzpe Ramon had more. What a crock. The impression I sometimes get of these journalists, besides their general bias and gullibility, is that they really don’t see very much of Israel. They can’t speak Hebrew or Arabic, for the most part, and they appear to have trouble fact-checking things they’re told. It doesn’t seem to occur to them that people they are inclined to trust might lie to them, or exaggerate for effect, or simply be mistaken. I can find a number of highly-rated English-language bookstores in Israel without leaving my computer. I’m not a bookstore-searching maven of any kind, I just have Google. There are numerous second-hand English bookshops around Israel too, e.g. The ESRA bookshop in Raanana (5 Klausner St.) and the Bookeshoppe in Petach Tikva (Mohliver St.) besides the Steimatzky and Tzomet Sfarim national chains selling new books. Harriet writes for those who live abroad. She imagines that the Guardian reading public knows nothing about Israel and can be fed any guff that she dreams up. The kind of Israel that the Guardian wants their readers to know about is a poor financially crippled little colony subsidised & supported by the generous USA, not the real Israel: flourishing & happy, producing record numbers of start-ups & scientific innovation . So why should her account of bookshops be accurate? I’m not surprised that we have had no articles from her praising the English language bookshops found in the PA or in Gaza since there probably aren’t any. There are half a dozen English bookshops in Ramallah and Bethlehem only! There are loads of Palestinians living there who’re American citizens and read in English, and countless diplomats and NGO workers. Please don’t talk about things you know nothing about. A quaint little second hand bookshop, albeit a little dusty and pungenty but nonetheless run by a nice old gentleman and his wife that also sells railway memorabilia has just put up a sign that it is closing down. Sad. Shall I inform (the soon to be closing down itself) anti-Semitic Guardian/ BBC? The photo that you posted was absolutely not taken at the American Colony bookshop. You’re mistaken. The shop is about five times that size and located in Jerusalem’s most luxurious hotel. It also sells countless works by famous Israeli writers, who regularly attend book launches organized by the shop inside the American Colony reception hall, which is considered one of the most prestigious venues for a writer in Israel. 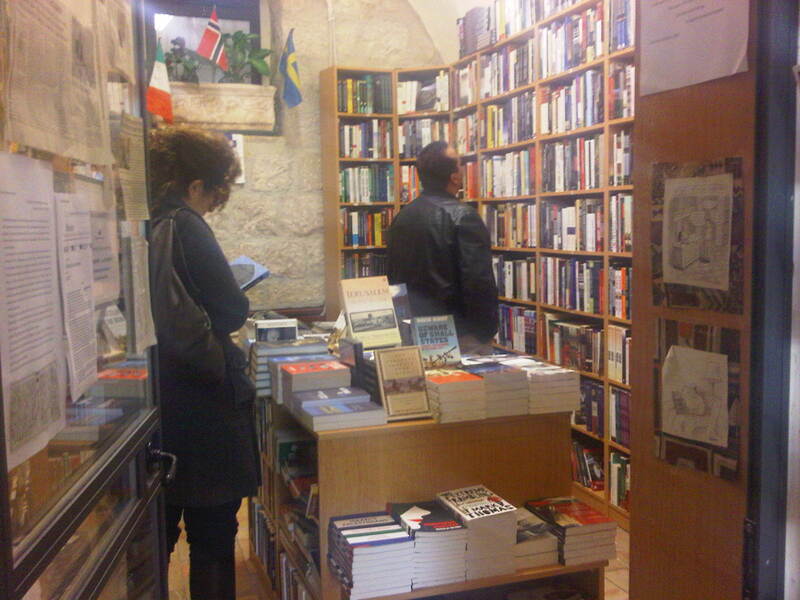 The bookshop is also the haunt of all foreign diplomats, foreign and Israeli journalists and… Israeli politicians. I assume you are not on their mailing list and never attended one of their literary events? This bookseller was born in Jerusalem, a city where his ancestors have lived for centuries. He spent a few years in the USA and now you’re telling us he should be expelled of Jerusalem because he’s a Palestinian Christian, not an Israeli Jew? This is extremely disturbing. It’s not the Guardian, it’s CIF Watch that is obsessed with this little bookshop. I fail to understand why M. Levick and the CIF team attack one of Jerusalem’s oldest cultural institutions, known for organizing chats between Israeli and Palestinian writers alike. Does CIF hate books and the English language that much? Culture of antisemitism and lies as demonstrated by the window display. Why would any decent person like it? 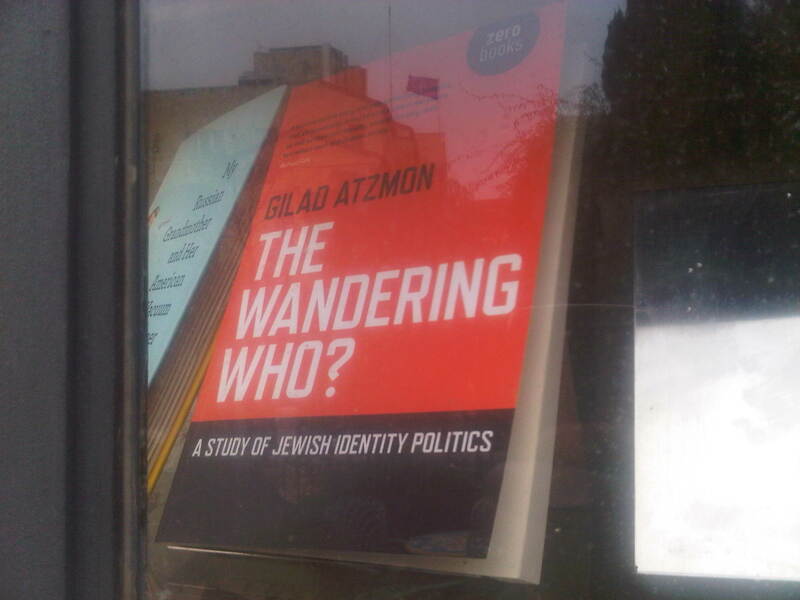 The American bookshop’s window also displays Israeli writer David Grossman’s “To the End of the Land” (in Hebrew, “A Woman Running from the News”). Are you telling us that Grossman too is part of a “culture of antisemitism”, Ariadne? That’s grotesque ! Yigal and Churchill, don’t bother. This is a site for about five people – or four people and one undermedicated person, Anthony Posner, who uses sock puppets such as Thank God I’m an Infidel, SerJew, Rupa, Snigger and Ariadne. You forgot to include yourself, sweetasshole, who´s the greatest fan ever. You get the Hypocrisy & Projection Award. Best laugh of the day! Poor little SmurfJew/Anthony Posner/Snigger/Blacklisted Dictator/Ariadne/Rupa/Thank God I’m an Infidel etc, all his multiple personalities are being revealed here and on other blogs even as we speak. You can run, but you cannot hide up in that messy bedsit of your. Beware, sweetasshole, maybe you are the next Mossad target! What a paranoid moron. SmurfJew/Anthony Posner/Snigger/Blacklisted Dictator/Ariadne/Rupa/Thank God I’m an Infidel etc, wake up and smell the coffee. You’ve been rumbled here and elsewhere. But then, without you and your many sock puppets, how would people entertain themselves here. You fool no one. zsa-zsa bye-bye. Beevis and Butthead. And paranoiac to boot. Beware, Cleopatra, Hoffman and Anthony are watching every step you take. I present Good nakba, sweethearts. A legend in his/her own mind. Still not worked out you have been found out, Posner, king of sockpuppetry? Never mind the men in the white suits will be with you shortly. I don’t suppose Al Guardian will update their report now. The Palestinian owner of the American Colony Hotel’s English-language bookshop will not be deported, after a special inter-ministerial committee granted him a two-year reprieve, after which he can apply to be a permanent resident. The Friends Seminary in New York, which made the God-awful mistake in judgment of twice inviting Gilad Atzmon to meet with its students, has now acknowledged that it was wrong to do so and has promised never again to allow that bigot to set foot on its premises. It has also promised to invite me and representatives of the Anti-Defamation League to address its students about the dangers of the sort of anti-Semitic hatred spewed by Atzmon.